I want to know which one of you is responsible for this. You’ve clearly hurt Quebec filmmaker, Xavier Dolan’s feelings, and I for one am not going to stand for it. He is only 21 years old and already he knows what it is to be tossed aside by critics who once purported to be his biggest fans. You built him up, and just because he didn’t do exactly what you wanted him to do, you declared him a disappointment and your earlier proclamations of genius to be premature. While I applaud your ability to admit your faults (even though the point was to highlight another’s), I’m not sure you realize just how much damage you’ve done. You should be fostering genius, not trying to kill its spirit. 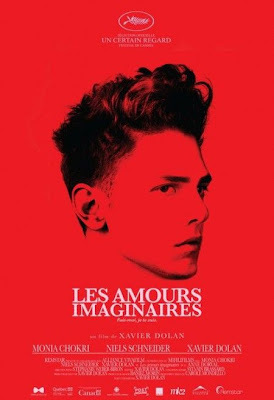 When I met Dolan at the 2010 Toronto International Film Festival, I expected him to sit with me and speak fondly of his second feature, LES AMOURS IMAGINAIRES (HEARTBEATS), which he wrote while attending the festival the year before. I had just seen the film, a cynical yet optimistic exploration of the ridiculousness we all put ourselves through when we think we’re in love. Cynical because we look like idiots; optimistic because we still put ourselves through it regardless. And even though I gushed about how much I admire him as a filmmaker right at the top of our chat, I was not met with fondness; I was met with skepticism. Friendly and polite but skeptical nonetheless. “It is a movie about the various steps of the love downfall,” Dolan proclaims, without necessarily seeing what a downer his statement truly is. “It is literally a condensed journey through typical, impossible love.” The kind of love Dolan is talking about, the same kind of love that comes across on screen, isn’t real but rather imagined (which is more evident in the film’s original French title, which directly translates to “Imagined Loves”).“The movie ought to be as shallow and as empty as the encounter they have.” HEARTBEATS does just this but it does so with sumptuous imagery and romantic grandness. It is a farce after all. I admire Dolan. Both of his films, regardless of how they compare with each other, are devoid of ego, an incredible accomplishment considering he wrote them both, directed them both and stars in both of them as well. His choices in all three of his roles on each film could easily serve his own self-interests, but instead serve only the story and the overall success of the film itself. This requires skill and dedication that I would never imagine a 21-year-old to have but yet here we are. And at 21, he has also learned a couple of other hard lessons he didn’t need to know right away. He now knows how it feels to be criticized on an international level and he clearly knows a thing or two about love. For further HEARTBEATS reading, be sure to check Black Sheep’s 4-star review. Click here.